As the title says I am asking if anybody here has built a powered standalone case for a 311A or B or C controller? I don´t want to "dedicate" my Wiard controllers to "just" a Wiard system but use them independently which means putting them into a case with a small power supply. I have a very good woodworker company here so I am basically looking for a good but small power supply solution. Do the controllers need + and -15v and how much A? P.S. : I would trade one of my 311A for a 311C (plus a little bit cash). All the JAG based controllers need regulated +/-15V, and like any analogue circuitry lower voltage noise is optimum. Switching supplies could be made small enough to fit, but don't forget they have high radiated noise levels and none of the controllers are shielded. Sometimes designing for ease of use is not compatible with the needs of the machines. With the original 311 controller I think this device would be much less sensitive to power supply noise, and using an off the shelf small switching supply mounted inside the case would be less cause for concern, as the controller is not processing signal, or generating it (such as the LFOs on the 311C). For the 311B/C, I would use a Hinton Full Power PSU in my main case, and fit an appropriate connector to the controller to receive power from the PSU on the main case. These supplies have the capability for an auxiliary power output (or several), and with the 19 pin connectors that are now specified (Trident Ringlock) for the aux output, you could put the controllers almost as far away from the main case as you'd like without the issues normally associated with sending the rail voltages some distance away from where they were generated. Thanks for your very detailed reply. At this moment I have 2*311A and 1*311B but would like to trade in one of my 311A for a 311C. According to your explanations I might try an "easy" solution with the 311A´s. Question though is for the non-tech: which one of the "off the shelf small switching supplies" is the recommended? I do have a Hinton power supply solution but nonetheless I much prefer a self-contained solution for the 311B (and maybe later the 311C) because I am rotating between rooms and floors and don´t want to carry a complete Wiard 300 system around. You may be able to find a good tech who can install a small classic linear supply PCB in the case being fed by an external encapsulated AC-AC wallwart transformer. This would be a good option IMO. Here are some options from the commercial market that are more "ready to go", none are as ideal as receiving aux power from a supply designed and tested for this application. This small supply is linear and may squeeze into a shallow case. You will need a 110% qualified tech to install it as mains power will go straight into the case, not via a sealed plastic wallwart which only puts out a low voltage (and mains voltage sits exposed on the input terminals to the supply). I did not think it was possible to find small linear bipolar supplies on the commercial market but the existence of this one could mean there are others, perhaps including a similar version to the Elpac wall warts that Grant used to use (I could not find an external +/-15V linear one myself). The switching supplies available on the market seem to only be designed for high output current, and I cannot find something 100% suitable. For example this has 150mV peak to peak output noise! I'm not sure of the exact requirements of the 311A, but if you don't have any other options I can look into it for you. Case by Goike. Internally has a Blacet PS. oh that's nice. My one Wiard regret is that my controller is perpendicular and not in a great place for use without causing backache. Here's one of mine that I built to use as a compact motorbike-transportable synth, and have used at several gigs. 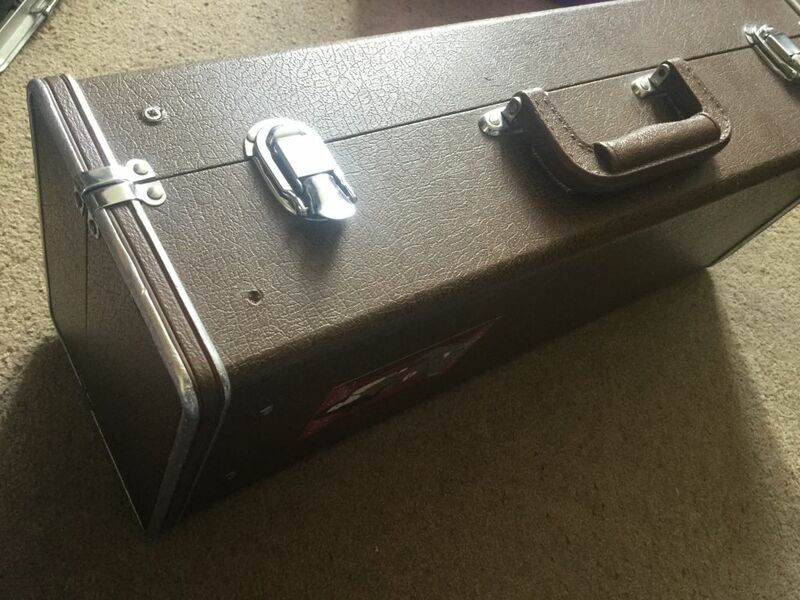 It's an Evenfall Mini Modular and a 311C installed in a funky old trumpet case (procured from eBay) that I removed the innards from and modified by replacing the hinges with lift-off ones. It is powered by a custom internal PSU from Hinton Instruments. It is still a work in progress, but at some point I will probably add another 1U panel with some odds and ends, and of course finish wiring up the mults on the 301. 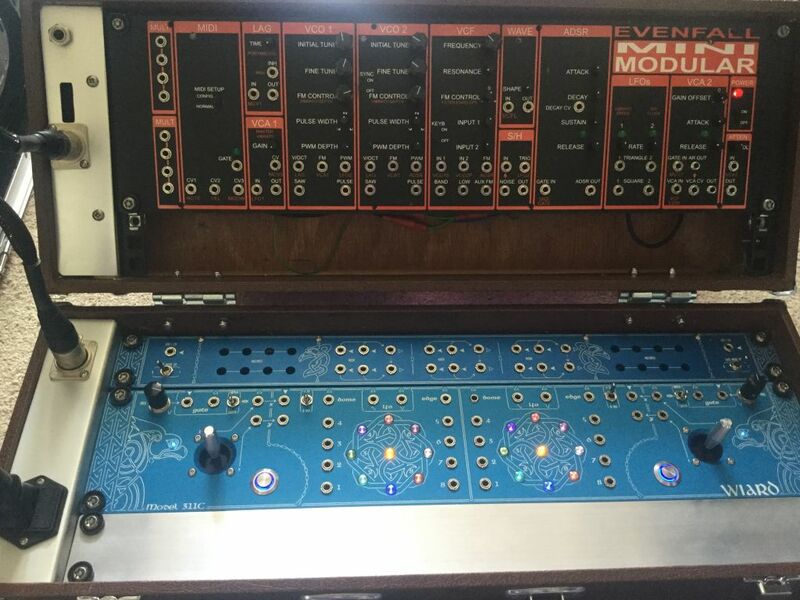 Ideally I'd also like to make a new faceplate for the Evenfall with Bantam jacks, and put a Bantam 311C in there, but that is a dream for someday when I have more time. Loving the trombone case stylings!